When was the Toothbrush invented? Historians tend to agree that the earliest type of Toothbrush were in the form of chewing sticks that were invented c. 3500 BC. The first known use of the chewing sticks was in Mesoptamia during the Ancient World period of invention (4000 BC - 600BC). Who invented the modern Toothbrush? The name of the man who is credited with the invention of the modern, mass produced Toothbrush is the English entrepreneur William Addis (1734 - 1808) who developed his invention in 1780. Definition of the Toothbrush: The Toothbrush is defined as a handheld brush of tightly clustered bristles mounted on a handle that is used to clean teeth and gums for oral hygiene. Fact 1: Who invented the Toothbrush? The name of the inventor of the modern, handled Toothbrush is William Addis who invented the device in 1780. However, the very first types of toothbrushes were in the form of chewing sticks that are believed to have been invented in Mesopotamia c. 3500 BC. Fact 2: Who invented the Toothbrush? Prior to the invention of the first type of Toothbrush, the chewing sticks, by the Mesopotamians c. 3500 BC, Neanderthal man used twigs with frayed ends as toothpicks and to clean their teeth. Fact 3: Who invented the Toothbrush? The Mesopotamians invented the earliest type oral hygiene aid in the form of chewing sticks. The Mesopotamian chewing sticks were made from the twigs of the Salvadora persica tree that contains a number of medically beneficial properties including abrasives, antiseptics and fluoride. Fact 4: Who invented the Toothbrush? The Ancient Egyptians also made a brush by fraying the end of twigs and evidence of these early toothbrushes and chewing sticks have been found in tombs of notable ancient Egyptians. The Ancient Greeks used strips of linen to clean their teeth. Fact 5: Who invented the Toothbrush? The use of the teeth cleaning twigs spread to the east and were known by the name of "Miswak sticks". The Miswak sticks, from the twigs of the Salvadora persica tree, strengthened the gums, eliminated bad breath and prevented tooth decay. Fact 6: Who invented the Toothbrush? The Miswak sticks were predominantly used in Muslim-inhabited areas in the Arabian peninsula and Africa. The use of Miswak sticks are frequently advocated in the Hadith (the traditions relating to the life of the Islamic Prophet Muhammad). The situations where the use of the Miswak sticks are recommended before religious practices, before entering the house, attending gatherings, when travelling and before sleeping and after waking up. Fact 7: Who invented the Toothbrush? The very first toothbrushes as such were made of the split, bushy ends of bristles taken from the stiff hair of animals such as pigs, or from the stiff flight feathers or the hollow tubular calamus (or quill) of feathers. Fact 8: Who invented the Toothbrush? The Ancient Chinese are credited with inventing the first natural bristle toothbrush in the 15th century which was made from the bristles from pigs' necks with a handle made of bone or bamboo. Fact 9: Who invented the Toothbrush? The Chinese Toothbrushes were introduced to Europe who adapted the design by using softer horsehairs, instead of the hard hog's hair, or feathers. The Europeans used a gentle abrasive such as soot, coal dust, brick dust and salt that they applied to the bristles. Fact 10: Who invented the Toothbrush? The invention of the modern, mass produced Toothbrush was made in June 1780 by the English entrepreneur William Addis (1734 - 1808). Fact 11: Who invented the Toothbrush? William Addis was raised in Clerkenwell, London and earned his living as a rag trader in the East End by collecting rags and then pulping them to make paper. Fact 12: Who invented the Toothbrush? In 1780 William Addis became in violent anti-Catholic riots, that became known as the Gordon Riots, when protestors marched on Parliament. William Addis was one of the 450 rioters that were arrested and was thrown into a prison known as St. George's House of Correction in Borough High Street. Fact 13: Who invented the Toothbrush? The story goes that whilst cooling of in prison William Addis, fed up with rubbing his teeth with an old rag and brick dust, came up with the idea of inventing a toothbrush. Fact 14: Who invented the Toothbrush? When he was released from prison he drilled half a dozen small holes into a piece of cattle bone then thread hog bristles through the bone and glued them into place. Fact 15: Who invented the Toothbrush? William Addis founded a company and started making the toothbrushes commercially from his premises in Whitechapel in East London. He had a great marketing idea to get his product know, As a paper maker he had had many contacts in the book industry and offered free toothbrushes to be given away with the books. His product became a success for both its novelty and functionality. Fact 16: Who invented the Toothbrush? The slave trade and the sugar plantations of the era were responsible for the rise in Britain's consumption of sugar. Prices of sugar dropped and increased the availability of sugar to the lower classes. By the 1790s, on average, each Englishman consumed more than 20 pounds of sugar per year - teeth began to quickly decay and the sales of the Addis toothbrush went up. Fact 17: Who invented the Toothbrush? William Addis became a very rich man. He died in 1808 and left the business to his three sons. The company continued to prosper and improved manufacturing techniques during the Industrial Revolution by introducing an automated manufacturing system in the 1860's. By the 1890's Addis were importing their tooth brushes to America and the across the British Empire. In 1955 the Addis company expanded its product range into a variety of other household and brushware items and introduced the Wisdom toothbrush in 1996. Fact 18: Who invented the Toothbrush? The design of the Toothbrush was improved in 1884 when a dentist called Dr. Meyer Rhein invented the first curved, three-row bristle toothbrush. Fact 19: Who invented the Toothbrush? Dr. H.N. Wadsworth submitted the first patent for a toothbrush in the United States (patent number 18,653) on November 17, 1857. His design for a new and improved toothbrush included separating the bunches of bristles to provide more elasticity enabling the gums to be thoroughly brushed. His design "intended to be of three, four and five rows of bristles". Fact 20: Who invented the Toothbrush? Leo Baekeland invented Bakelite, the first fully synthetic plastic in 1907, and celluloid plastic brush handles appeared on the toothbrush during WW1 (1914 - 1918). Fact 21: Who invented the Toothbrush? Wallace Carothers invented Nylon in 1935 and the nylon toothbrush, the first toothbrush to be made with synthetic bristles, appeared on the market in 1938. People preferred the nylon bristles because they were softer and more hygienic than the previous animal bristles. Fact 22: Who invented the Toothbrush? 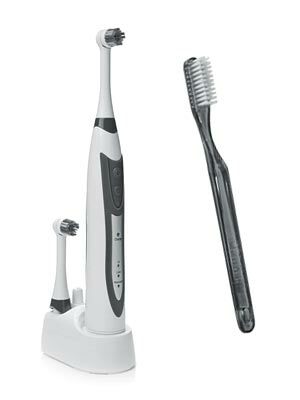 The first electric toothbrush, the Broxodent, was invented in Switzerland in 1954 by Dr. Philippe Guy Woog. Fact 23: Who invented the Toothbrush? The first ultrasonic toothbrush, initially called the Ultima and later the Ultrasonex, was patented by Robert T. Bock, patent number US 7849548 in the United States in 1992. Fact 24: Who invented the Toothbrush? The humble toothbrush has been voted the number one invention that people can not live without - beating the computer, the cell phone and the car! For additional interesting facts refer to Who invented Toothpaste. Who Invented the Toothbrush? - William Addis - Invention - Definition - Meaning - Famous - Device - Innovation - Significant - Development - Household Items - First - Definition - Kids - Facts - Information - Info - Who invented the Toothbrush - Dates - When - Why - Impact - Purpose - Use - New - Old - Definition - Meaning - Awesome - Cool - William Addis - Toothbrush History - Toothbrush Timeline - Who invented the Toothbrush?